The Variable Hawks (Buteo polyosoma) are South American birds of prey that are also known as Red-backed Buzzards or Red-backed Hawks. Males are sometimes referred to as "Grey-backs." Their common name "Variable Hawk" is derived from their highly variable plumage, with at least 27 distinct adult plumages having been identified - possibly more than in any other bird of prey; except maybe the widespread Red-tailed Hawk and Common Buzzard. Vagrants overwinter in southern Brazil. Habitat: Generally appear to favor more open habitat at all elevations; particularly occurring in scrubby areas, where they mostly hunt for prey by hovering. 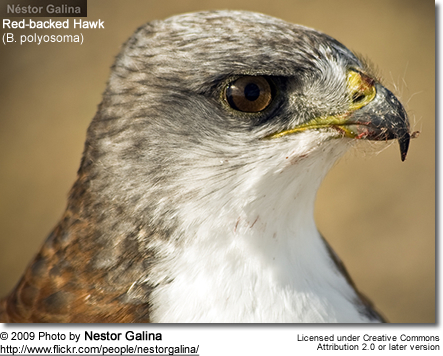 Some authorities split this race up into the widespread Red-backed Hawk (Buteo polyosoma) and the Puna Hawk or Gurney's Hawk (Buteo poecilochrous) of the central and north Andean highlands. However, the differences are not well defined; therefore, recent authorities have recommended treating them as a single species. Range: Central Andes of Colombia south through the Andes to Patagonia and Tierra del Fuego; as well as the Falkland Islands, where about 500 breeding pairs are found. The nominate race occurs in a wide range of habitats, including above the tree line in mountains, Pacific coastal foothills, Patagonian steppes, agricultural areas and edges of river galleries, beech woods and humid premontane and lowland forests.The disputed Puna race occur above the tree line in paramo and puna habitat at higher elevations than almost any other raptor - mostly occurring at altitudes of 16,400 feet or 5,000 m and above. They usually rarely move below 9,500 feet (2,900 meters). Range: Alejandro Selkirk Island, previously known as Isla Más Afuera, which is part of the Juan Fernández Island group, off south central Chile. Occurs on the islands' volcanic slopes and barren grazed grasslands at all elevations. The Variable or Red-backed Hawks are large buteos, measuring from 18 - 25 inches (45 to 62 cm) in length and a wingspan from 45 - 60 inches (113 to 151 cm). They weigh from 1.8 - 4 lbs (800 - 1,800 grams). The plumage is highly variable; with both males and females occurring in several color morphs. The most constant features are the white tails and theblack sub-terminal bands (a band of color near but not precisely at an end of the tail feathers). The grey wings are barred dark; when in flight from below, the flight feathers (remiges) appear whitish with fine barring and a broad black tip. Males typically can be identified by their grey backs. The plumage below is mostly grey or white. Rarely, males may have reddish-brown backs. Females are larger and generally have a reddish-brown back; their plumage below is either white or reddish-brown. Sub-species ID: The adult plumage of the Juan Fernandez Hawk (b. exsul) from the Juan Fernández Islands is generally a little larger in size and the plumage is far less variable, being mostly whitish below and grey above. Variable Hawks mostly feed on mostly small mammals (90% of their diet) that they hunt while soaring on warm thermals or from a raised perch, such as tall trees or sign / lamp posts. They will also take medium-sized animals. They feed on guinea pigs, tuco-tucos (South American rodents), rabbits, mice and paramo rats. They will also take frogs, lizards, snakes, fish, earthworms, weevils (beetle), and Orthoptera insects, such as grasshoppers and crickets. Occasionally, they will catch birds, such as petrels. 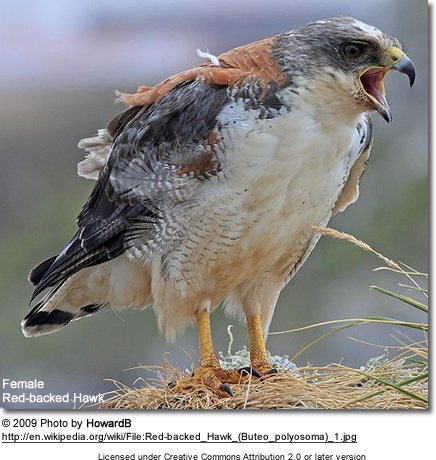 Red-backed or Variable Hawks construct large nests out of sticks and vegetation and place them on elevated structures, such as rocky outcrops and low cliffs. Nests may be reused each year and they may hold up to three nests within their breeding territory. They may breed cooperatively. The average clutch consists of 1 - 3 eggs, which are incubated for 26 - 36 days. The nestlings fledge (leave the nest) when they are about 40 - 74 days old. Those occurring at high elevations take longer to incubate and to fledge than those occurring at lower elevations; due to the temperature differences. Eggs that are exposed to colder temperatures will develop at a slower pace.